Rihanna gave K-Dot props for allowing her to be on such an incredible record. “Thank you Kendrick for giving me this incredible opportunity to be on such a great record, I love this record, and be on it, congrats you deserve this award,” she said. Kendrick Lamar received the award right after he kicked off the Grammys with an electrifying performance with U2 rock legend Bono and The Edge. K-Dot also won two early awards for Best Rap Song and Best Rap Performance for his single “HUMBLE.” The music video “HUMBLE” is also nominated for Video of the Year and is expected to win. Damian “Jr. 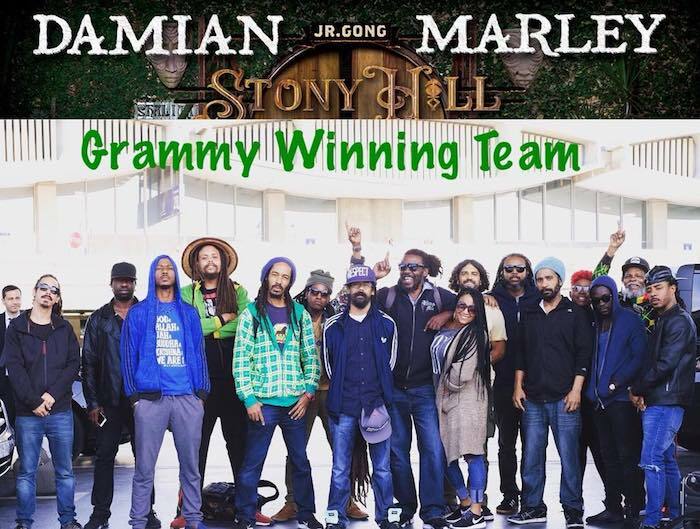 Gong” Marley wins the 2015 Best Reggae Album Grammy for Stony Hill. Gong picked up his third Grammy at the 60th annual Grammy Awards ceremony at Madison Square Gardens in New York City on Sunday night. Damian Marley released the 18 track album on July 21st in 2017. The project was released under Republic Records and saw guest appearances from Stephen Marley and Major Myjah, with Stephen and Gong executive producing the project. The Best Reggae Album category saw some strong contenders this year with Morgan Heritage, Chronixx, J Boog, and Lost In Paradise all getting nominations after putting out some well received albums. Chronixx’s Chronology LP was one of the hot favorites to win the award, but Damian Marley edged him out in the end. Chronixx lead the online polling leading up the the award ceremony with 29% of responding giving him the edge to win the Best Reggae Album Grammy. Stony Hill peaked at No. 1 on the Billboard Reggae Chart last year and spend a few weeks there. The album sold 18,000 copies in the United States alone up until the time of this publication. Damian Marley previously won the Best Reggae Album Grammy award in 2002 for his Halfway Tree album. He won his second Grammy in 2006 for his landmark album Welcome To Jamrock.